Lock in a great price for Clarion Inn Grand Junction – rated 8.8 by recent guests! With the traffic at breakfast the crew did an amazing job keeping up with everything. The staff was so friendly. Excellent customer service. The room was so spacious. The room was clean and bed was comfy. The room is spacious and clean. The on-site restaurant was very, very nice. Breakfast was incredible with lots of choices. Great staff all around. Needs more updates tp property. Breakfast could be better. Staff was very welcoming! Hotel had plenty of parking and total privacy. Indoor pool and outdoor pool with hot tubs was a plus! Great hot buffet style breakfast! Good value for the price. The rooms are clean and comfortable. Morning breakfast was good, with a variety of both hot and cold foods. We brought our pet, London. We were stoked to find out that the front desk has free pet sitting! What an awesome perk! 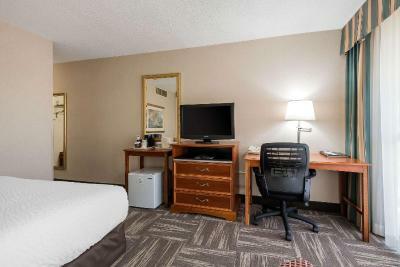 Clarion Inn Grand Junction This rating is a reflection of how the property compares to the industry standard when it comes to price, facilities and services available. It's based on a self-evaluation by the property. Use this rating to help choose your stay! 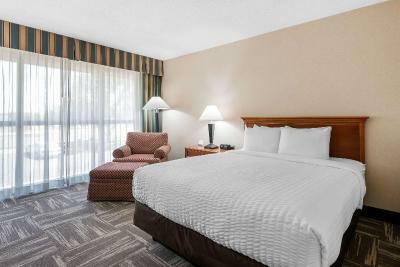 Located off Interstate 70, the Clarion Inn hotel is one half-mile from Grand Junction Regional Airport. 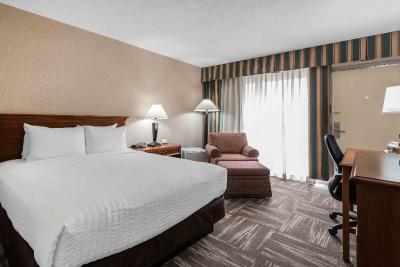 Popular attractions like Two Rivers Convention Center, the Dinosaur Journey Museum, Colorado Mesa University and Colorado National Monument are all minutes from this Grand Junction, CO hotel. Business travelers can take advantage of modern conveniences afforded in our business center like a public computer with Internet access, and copy and fax services. We have several banquet and meeting rooms; the largest can accommodate up to 392 people for most business or social functions. 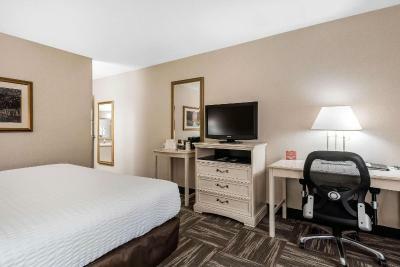 In addition to standard amenities, our guest rooms are equipped with coffee makers, curved shower rods, hair dryers and cable television with free HBO. Some rooms have hot tubs, microwaves, refrigerators, pillow-top mattresses, work desks, wet bars and sofa sleepers. Nonsmoking and connecting rooms can be requested. Enjoy a variety of additional amenities like our indoor heated pool, outdoor heated pool, hot tub and exercise room. As an added convenience for our guests, we are a pet-friendly hotel with no pet fees. A gift shop, coin-operated laundry facilities and valet cleaning services are also offered. Ample free parking is available and can accommodate most cars, trucks or buses. Grand Junction is in Colorado's wine country, home to more than a dozen wineries including the Carlson Vineyards located in nearby Grand Valley. Golfers will enjoy the close proximity to a variety of local golf courses. There are several shopping centers and entertainment areas in the vicinity. This property is also rated for the best value in Grand Junction! Guests are getting more for their money when compared to other properties in this city. 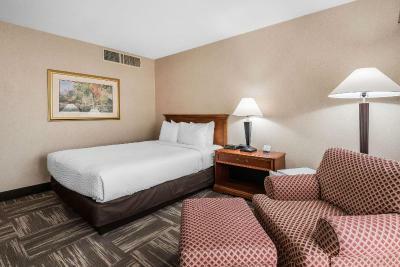 When would you like to stay at Clarion Inn Grand Junction? Free Wi-Fi and a cable TV with premium channels are included in this room. House Rules Clarion Inn Grand Junction takes special requests – add in the next step! Clarion Inn Grand Junction accepts these cards and reserves the right to temporarily hold an amount prior to arrival. The water in the hot tub needed to be hotter. Had someone else's wash cloth wrapped in the shower curtain that fell out when I showered. Bathroom had hair on floor from previous occupants. A/C rattled all night. Breakfast options not great- oatmeal had no toppings. Hard boiled eggs tasted old. I didnt like the pillows. They where all the same size and too big. I liked the indoor pool and breakfast. Everything about my stay was great. Check-In was so. There should have been signs saying was needed so that people could be ready. Also the rooms next to us were noisy people. The building is aging, although, still maintained nicely. I only noticed one problem with this access restroom. While it did not affect me in particular, the setting of the toilet could severely impact a wheelchair or walker bound person. The toilet faces the sink countertop with a very narrow area between the front of the toilet and countertop. Toilet should be turned 90 degrees to face the open room. Very friendly and helpful staff. Very clean room and well appointed room, especially at the price point. Disabled room was well set up for needs. I only noticed one problem with this access restroom. While it did not affect me in particular, the setting of the toilet could severely impact a wheelchair or walker bound person. The toilet faces the sink countertop with a very narrow area between the front of the toilet and countertop. Toilet should be turned 90 degrees to face the open room. Hair drier blew up. Room to warm. Pool area great. Breakfast very good.